It is a crisp fall afternoon. In the distance across the yellowed stalks of the autumn agricultural fields near Dacono, the Colorado Rocky Mountains stand against an azure sky. We are at the EarthRoamer facility, where four dozen or so workers bustle about zipping under vehicles, working in the wood shop, installing miles of colored wiring bundles, or leaning over a stripped down chassis brainstorming solutions for a tricky design challenge. Everyone is busy, yet everyone pauses with a smile when we pass through their work areas. We are visiting EarthRoamer to get the behind-the-scenes understanding of one of the most iconic off-road camping vehicles out there. Back country boondocking with a traditional RV can be problematic at times. Many travelers have had to look longingly at dashed lines on maps, left to wonder where the trail less traveled might lead, instead of following it without worry that their rig can handle the off-road conditions that might exist. Designed and built from the ground up at their headquarters in Dacono, Colorado, the EarthRoamer is the ultimate back country adventure vehicle that is equal parts beauty and beast. Coined as ‘XVs’ (Xpedition Vehicles), these machines are designed to be fully off-road capable, self-sufficient, four-season sanctuaries with every customized detail and extravagance included. The first EarthRoamer came to life in 2003, and since then almost 200 units have been hand built: 100 of the original model (XV-LT), and almost as many of the newer XV-LTS model, which is the “stretch” version. Twenty-five XV-LTS models were built in 2017. Each one is customized and painstakingly designed and assembled with extreme attention to every detail. 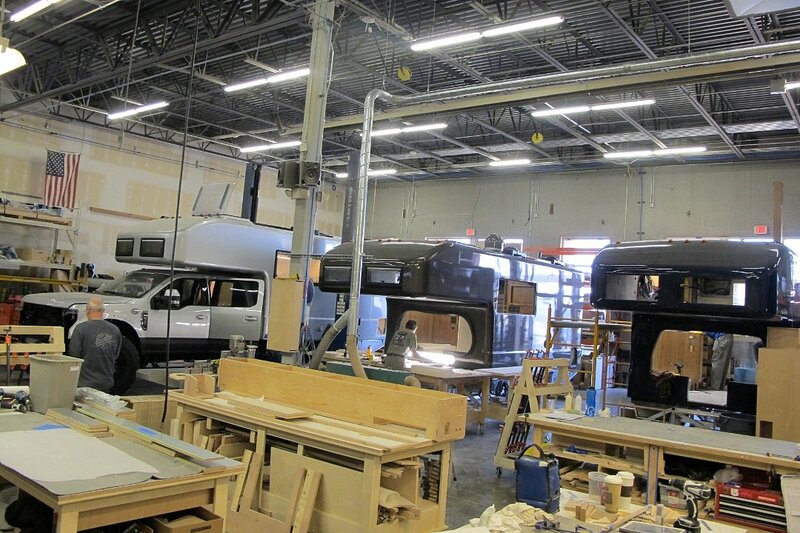 One of the unique aspects to the EarthRoamer facility is that every component—from the electronics to the custom cabinetry and upholstery—is hand crafted on-site by the fifty-five people that make up the EarthRoamer staff. The process begins with a rugged four-wheel drive Ford F-550 Lariat chassis, stripped down to its bones and rebuilt to EarthRoamer’s high design standards, including burley sway bars, shocks, and wheels. The cab interior is upgraded with everything from leather captain’s chairs to security bolts on the doors. A fiberglass monocoque (constructed as one piece, no seams, no metal, completely sealed to prevent rot) shell is then carefully insulated and constructed with custom options before being added to the chassis as a completely self-sufficient unit. 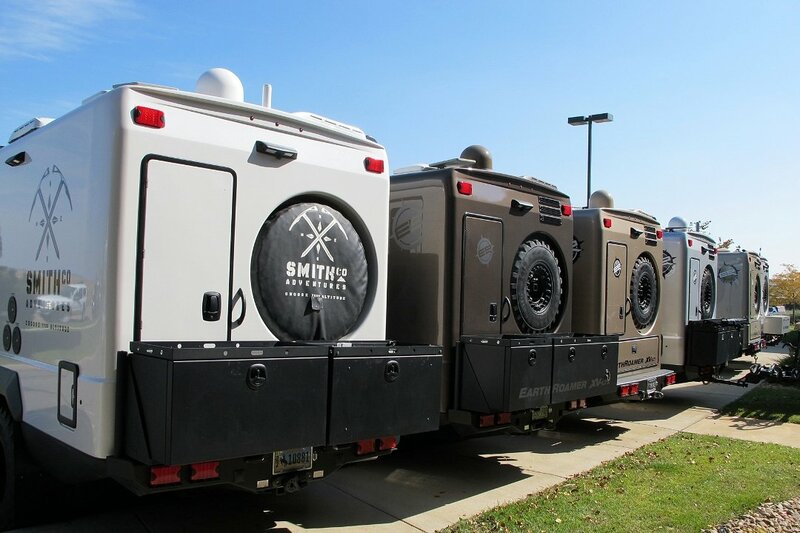 EarthRoamers are fully solar (no propane tanks or noisy generators), providing over 1300 watts of power (80 amps DC) to operate the entire unit. With a capacity for 100 gallons of fuel and a 90 gallon water tank, back country exploring over many days opens up terrain and adventures that were not readily achievable before. Before being passed to a customer’s hands, each XV endures a 250-mile test drive followed by a 4-hour intensive inspection of every system and component by the company president. Interior embellishments like a 31-inch HD satellite TV, video security cameras, king-sized bed, wine rack, convection microwave oven, recessed dimmable LED lighting, and marble countertops have been designed with the comfort of the user in mind. The interior sleeps four comfortably, while providing ample storage space. The rugged exterior includes an outdoor grilling station, front and rear 16,500 lb winches, independent air suspension, and up to 41-inch military tires. 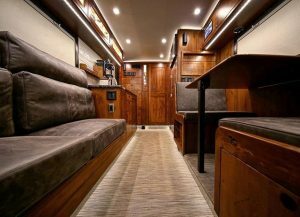 EarthRoamers include air conditioning and heating units, as well as being insulated to accommodate 4-season adventures. EarthRoamers have been tested to temperatures of -45°F, an upwards of 100°F, and circumnavigated the globe. Each year, an Owner’s Rally is held in a different location for owners to explore and enjoy their XVs. EarthRoamer staff share techniques and new design ideas are generated from customer feedback. Servicing on EarthRoamer units is done at the factory where they are built, so the same hands that created them are there to ensure the product is serviced to meet quality standards. New for 2017, EarthRoamer is debuting its new model, the XV-HD. Built on the chassis of a Ford F-750 with dimensions of 35 feet long and 13 feet high, this XV features: 2000+ watts of solar power, radiant floor heating, 7-foot ceilings, 250 gallons of water storage, 115 gallons of fuel, and the first entirely vacuum infused body. Five of these decadent XV-HD units have been sold, and the first one is due to come off the production line in a few weeks. As you might expect, the EarthRoamers come with a hefty price tag. New XV-LTS models start at $450,000 and the XV-HD starts at $1.5 million. Because each unit is customized, it takes 6-9 months for each to be built. There is a pre-owned purchasing program through EarthRoamer, and it is interesting to note that the pre-owned models often are sold for more than their original cost. Each has been inspected by EarthRoamer staff and carry a limited warranty. 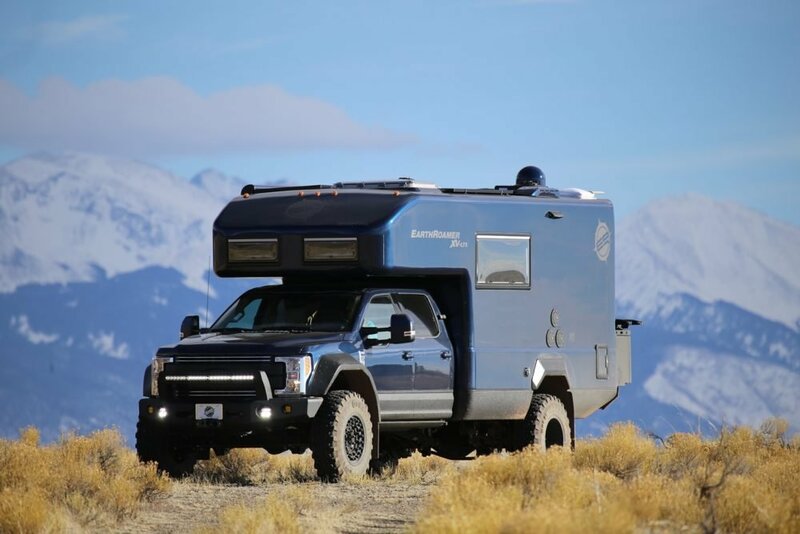 EarthRoamer is truly an amazing vehicle that sets the standard for off-road opulence camping. Even for those that can’t afford the price tag, it is really impressive to see what is possible and the innovations being developed. Even more so, the passion and dedication that the EarthRoamer staff has for their product and their process is astounding. Pride and craftsmanship is evident down to the smallest detail of these hand-crafted, made in the USA, Colorado Proud products. The article makes it sound like EarthRoamer was the first company to make off-highway RVs, but that’s far from true. 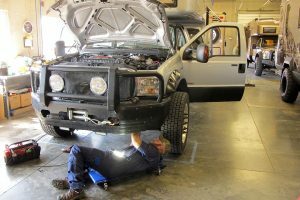 They’re normally called “expedition” vehicles, and there are several well-established companies building them. Also, EarthRoamers are not “fully solar”: they have engine-run 3.7 kW generators. They are not even fully electric: they have diesel-fueled water and space heaters. And what is “independent air suspension” supposed to mean? None of the chassis used by EarthRoamer have independent suspension, either front or rear. Would like to see a unit built on a Ram 5500 chasis. Not much comfort in Ford’s Diesel engine. Would like to see a unit built on a Ram 5500 chasis. Not much faith in Ford’s Diesel.